I've search around a lot but couldn't find a real, up to date, answer so here I am. I'm working on my inventory / menu system. I defined a key in Project Settings -> Input called "Toggle Inventory" and mapped to both spacebar and my controller start key. The issue is... how do I go back ? I do know about the "KeyDown" event that can be overriden in UMGs, but you can't use the keys defined in Project Settings -> Input, you have to hard code the keys used.. I want my user to be able to customise that key later down the road, so hard coding is not an option. A lot of old answers say to trick the system by leaving the InputMode at "Game and UI" and use the PlayerController to go back... that seems uggly. Any up-to-date idea / tips ? This function will allow you to bind any predefined action, hope that helps! Hi, thanks for that! I just look it up but I don't really know what an "action" is in this case. It wants a string, I tried feeding it my input name, but to no avail. Do you have any experience or examples in using this ? I edited my answer and added a screenshot. Thanks again. That's what i tried but it didn't work. Is "Fire" defined under Project settings -> Input ? If yes, could it be an issue of focus on the Widget ? For completion sake, what key did you bound to Fire ? Yes Fire is an input action defined under Project Settings -> Input. If it doesn't work it might be because of the input mode, make sure you either use FInputModeGameAndUI or FInputModeUIOnly. Focus could be the issue as well, you could try to set the focus manually if the previous point didn't make it work. Tried it again, everything's looking right but I can't make it work with "UI Only", "Game and UI" does work though. With UI only my string is never printed... Did you managed to make it worth with UIOnly ? It seems like input components from actors and UMG widgets are handled the same way, both won't receive input with InputModeUIOnly. So it seems like you do actually have to use GameAndUI mode for menus, the UIOnly mode seems to be really only for clicking buttons etc. Guess I'll look for an hacky way now that I know the clean one won't do it. Yes, the idea of the other users is right.. you have to use the playercontroller to get the toggle inventory event to the umg.. its nasty. What might be possible is accessing the keybind information and use that knowledge to know what key press should trigger closing the umg. A good place to start is probably looking at this code: https://forums.unrealengine.com/showthread.php?51449-Full-Project-Rama-s-UMG-Rebindable-Key-System-Rebind-keys-at-Runtime! If you set to UIOnly, keyboard is disabled. If you use UIOnly input is disabled for actors, but the UI can still receive keyboard events! As the names suggest UIAndGame will allow actors AND UI to receive input and GameOnly will only allow actors to receive input. 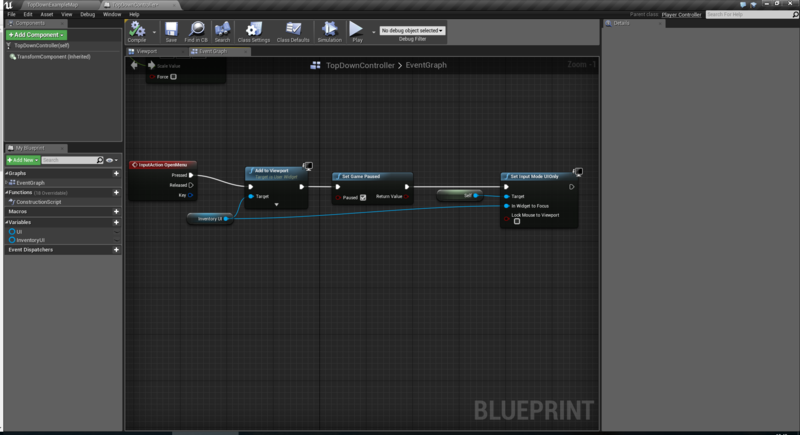 What is Input: Gesture Keys are now blueprint bindable?